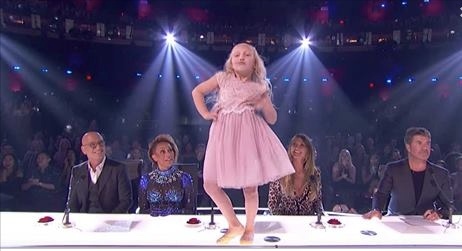 We love showing off our favorite performances from “America’s Got Talent” — people are constantly surprising us with the level of skill that they possess. And these two kids you’re about to see? They’re some of the best. The performance starts and Paige begins dancing on the judges’ table while Artyon is sliding on the floor with backup dancers in tow. He hops up without effort, and the performance gets better from there. Artyon even jumps up and lands in the splits, something no one expected from the 10-year-old boy. As they continue to dance together, it’s obvious that these two kids have chemistry. They are performing flawlessly. Then comes the well-known part of the song where he shouts “got to cut loose!” they are performing their routine flawlessly. Even Simon is starting nod and bounce his head with a smile while watching these two. Read On to watch their adorable and awesome performance! They were great.they shouldn’t of got eliminated. OMG OUTSTANDING EXCELLENT AMAZING TALENTED BEAUTIFUL INCREDIBLE PERFORMANCE LOVE THEM ! I feel really bad for the little girl that didn’t win and I was so happy when Simon when over to talked and hugs her. I don’t know how they can just pick one. I loved them! Simon is such a great guy isn’t he? Angelica Hale looked kinda lost! In life there are winners and losers, yes, I’ve seen many cases where I wished they had all won, but how would that be a competition? Parents that protect their kids from disappointment are only delaying the inevitable at which time the impact might be beyond that which they are prepared. Doing that would be similar to the fool thing the schools are now doing, pushing the unprepared ahead. No one fails until they get into the real world, then it’s too late. It’s truly unfair to the children. Hope that answers your question as to “How can they just pick one?” They pick the best, it might not be your choice, it might not be mine either, they got the job. The kids were amazing! I agree with you whole heartedly Eric A. Jollymore. A mi no me abren estos vidéos, no se como hacer…. I wish I had at least half the energy the little girl has. The kids have GREAT TALENT there danse is so MARVELOUS. They must continue a BIG DOOR will open for them.BRAVO BRAVO BRAVO. Incredible performance. Both are very very good. I don’t understand why they were eliminated . These two are super great!!! Too much face-thingy/expression, it kept me from looking at the dancing. I had to play it again so I could only watch the dancing. Good job. A must watch! Turn up the volumn!!!!! WHAT A GREAT JOB KIDS THAT WAS SUPER!!!!!!!!!!!! Wow these 2 are amazing, but the girl needs to close her mouth. Love, Love, love me some Henry Gallagher. ******* talented young lad! That was amazing to watch.